PLEASE BE AWARE THAT THE DOG WARDEN WILL BE PATROLLING OUR COMMUNITY. 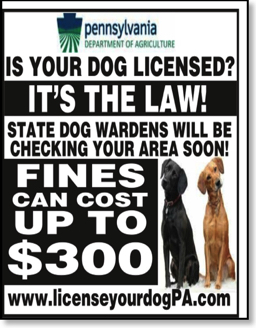 HE WILL BE CHECKING THAT THERE ARE NO DOGS RUNNING LOSE AND THAT ALL LICENSES AND VACCINATIONS ARE UP TO DATE. PLEASE REMEMBER THAT IF A DOG IS FOUND WITH A LICENSE IT MEANS A FAST RETURN TO THEIR OWNER.